View of Pfutsero from watch tower of Glory peak. 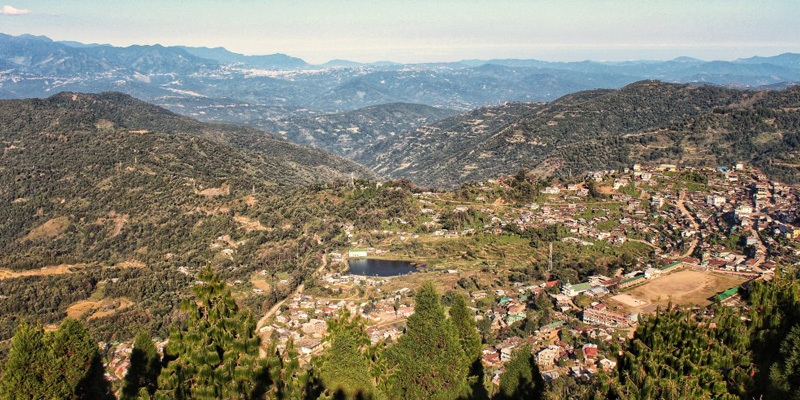 In the North East corner of India, explored even less in textbooks, sits the phenomenally beautiful state of Nagaland. Untouched by the constant pursuit of industrialization and modernization, many places in the state holds the rustic charm. Terrace rice fields of Phek District. I was overwhelmed staring at the gorgeous rice fields of Zapami, a quaint village in Phek District of Nagaland, while warming my hands with a cup of piping hot tea. 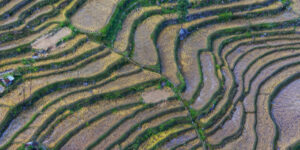 It was unbelievable and overwhelming to witness the terrace rice cultivation interspersed with trees. The setting sun threw a palette of rainbow colors on the sky. The roadside orange & purple wild flowers danced to the tune of the wind and I realized this is a moment of sheer joy with the benediction showered by nature. My visit to a remote village in Phek District, Zapami turned out to be a beautiful experience. I stayed in the village hosted by a local family, eating fresh garden plucked vegetables and admiring the terrace cultivation in its harvest season. 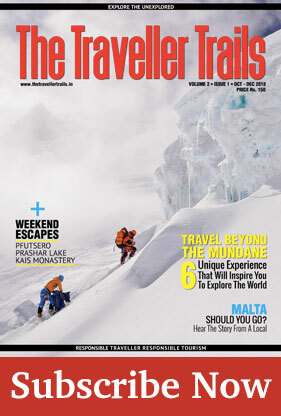 This trip led me to another lesser known hidden gems of Nagaland, Pfutsero – the coldest habitable place in Nagaland. It was like rekindling a love affair the moment I stepped into the beautiful town of Pfutsero (2133 m). The town is located in Phek District mostly dominated by Chakhesang Tribe. It is the highest town in the state. The wild flowers spread the colors of nature. It is a simple and sleepy town that comes to live with Cherry Blossom during December, turning the hill station pink. Surrounded by the hills, one day is enough to explore the place and its hidden jewels. It is not frequented by many tourists due to lack of awareness and distance. It is the kind of place where you relax and soak in the bliss of nature. Start the day with a morning hike to Glory Peak. It is an easy and short hike with awe inspiring views from the top. 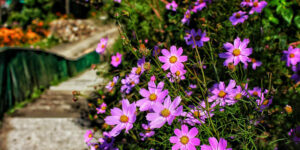 As you walk along the concrete path, you will witness colorful wild flowers growing on the side of the road. The clouds play hide and seek with the hills as you continue to ascend. As you reach the top of the peak, walk up to the view point tower to get a 360° view of the town, surrounded by hills. The view from the top is amazing with clouds rolling on one side and a clear view of the town when it is sunny and bright on the other side. 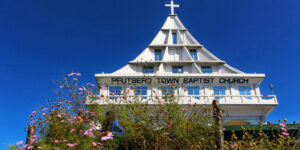 After climbing down from Glory Peak, grab some quick breakfast and visit the Pfutsero Baptist Church which can also be seen from the peak. It is a beautiful church surrounded by natural flowers and a very peaceful vibe. A walk to both Glory Peak and the church will not take more than 4 hours. Chida Post is few km away from Pfutsero and can be reached with a car. 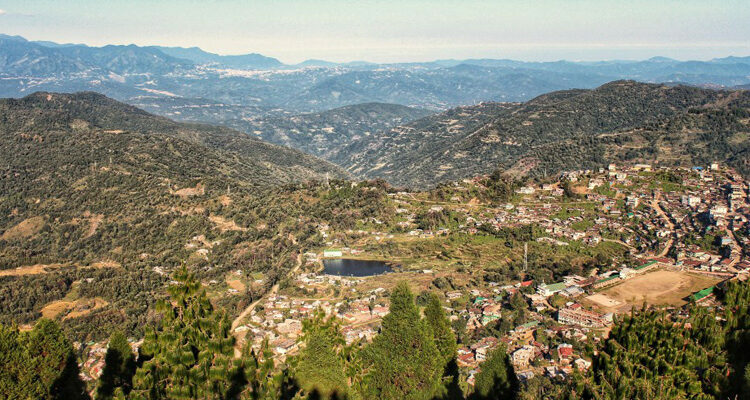 It is a beautiful valley surrounded by the half hidden hills perched on the border of Nagaland and Manipur. There is a lake that welcomes you to the valley and as you walk up, the rolling hills cast its charismatic charm. HOW TO PLAN A TRIP TO PFUTSERO? The best option is to hire a cab from Kohima to Pfutsero because the public connectivity is very limited and at times not even available. However, there are shared cabs available from Kohima and Dimapur for Pfutsero. If you are planning to travel from Dimapur, book your tickets a day before from the taxi stand next to Hill Star Cinema Hall. There are no cabs on Sunday. Unfortunately, accommodation is very limited in Pfutsero. There is just one mini tourist lodge due to extremely low tourism in the place. You will most likely reach Pfutsero by late afternoon leaving you with few options to explore. Ask the local people or at church for availability of accommodation. People are nice, they will help you. The best time to visit Pfutsero is during the month of November and December. The best option is to club it with Hornbill festival of Nagaland. During the month of December, the town turns pink with the blooming of cherry blossom. 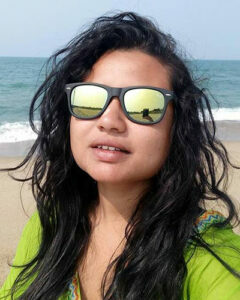 Upasana Kakati is a guest lecturer with Nagaland University and an avid solo traveler. She loves exploring offbeat terrains and soak in new culture when she gets a break from her work. She is a passionate travel blogger and documents her travel journey on her blog Unconventional and vivid. When she is not traveling, she is either teaching or planning her next trip.